3 weeks after my initial measure-up for a suit I returned my ‘mystery shopper’ form. A couple of days later my payment arrived, voucher for subsequent purchases from the tailor. I think they liked my feedback because they’ve given me twice the standard payment for my mysterious shopping. 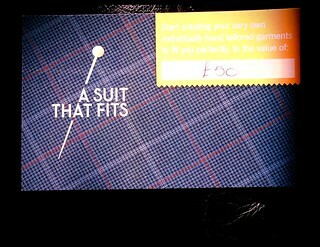 This means that I can buy a bargain price hand tailored shirt to match my suit. Nice, they are doing a good job of building customer loyalty. This scribble was published on Saturday, July 27th, 2013. You can follow any banter on this scribble with the RSS 2.0 feed. You can share your inspired musings after typing the anti spam word near the bottom of the page. But no Pinging because its too naughty. I’m really looking forward to it too! Make him sew faster!